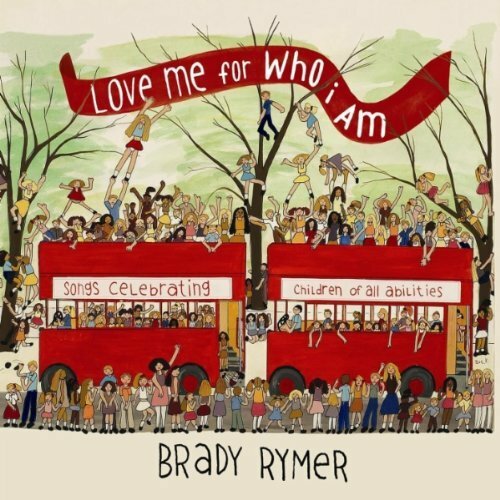 My friend Jeff Bogle, of Out With the Kids, calls Brady Rymer‘s Love Me for Who I Am the album he was destined to make, and I couldn’t put it any better. Full of hooks and effervescently charming musical turns, it has something for family members of all ages — and music fans of (almost) all persuasions — but that isn’t even all of what makes it so special. There’s also a really wonderful story behind the music, which, among other things, Brady shared with me during a recent interview. Here’s a transcript of our discussion, and a widget that will let you stream the whole album while you read. Enjoy. Your new album, Love Me for Who I Am, was a collaboration of sorts with a school called Celebrate the Children, whose mission is giving support and respect to children with sensory processing difficulties — conditions such as autism. How did you get involved with them? Well, I was with this other band — I still am, actually — called From Good Homes. And by the late ’90s, that band was dissolving around me, and it just happened to coincide, for me, with starting a family and having kids. And my friend Monica, who founded the school, knew I was looking to do something, and she said, “Come on out and play your guitar at our summer camp — the kids would love to hear your music.” And that’s how my relationship with them started. That was about ten years ago, and they just kept playing my CDs when I’d release them. Eventually, Monica ended up marrying Dan Myers, who produces my music, and that strengthened our connection to the school. I’ve kept going back to play those shows, and it’s just been an incredibly great gig — always a lot of fun to do. This entry was posted in Interviews, Music and tagged Bernie Worrell, Brady Rymer, Celebrate the Children, Interview, Jeff Giles, Laurie Berkner on April 1, 2011 by Jeff Giles.